SAT Tutoring In Full Swing, Can You Help? In the midst of what seems to be the most radical defunding of public education in the history of Georgia, Dell MacLean suggested that Student Career Alternatives Program consider providing free SAT tutoring classes to students that couldn't afford the typical $500 SAT courses. When everyone supported the idea Dell went beyond simply suggesting it and organized it. For the past few months we've been provided free SAT tutoring sessions to a dozen high school students from around the metro area. 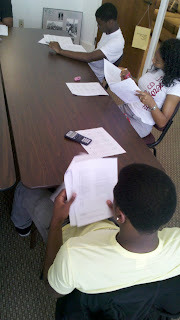 This past Saturday students participated in our first mock SAT test. While it's clear that all of the students that come out for our tutoring sessions are extremely bright, the SAT test has proven to be a real challenge. Not one student cracked a 1200 score. For those of you that don't know 1200 is the new score requirement for eligibility for the HOPE scholarship. Now we already know that the SAT test is culturally bias, we know that only 2.7 percent of African Americans and 5.7 percent of Mexican Americans score a 1200 on the SAT test(as compared to 21.5 percent of whites). Clearly the public education system in our state is, by design, more unjust than it's been in decades. We obviously can't provide free SAT tutoring to everyone in the state that can't afford it. It's taken a ton of work just to start with a dozen. What we need is real reforms, a real revolution of values, a shift in spending priorities. Providing free SAT tutoring sessions to Atlanta youth might seem like such a drop in the bucket, but it means so much more to the students and parents that are receiving the sessions. The direct services we've been providing to students and parents has also been another opportunity to start conversations with folks in the community about budget priorities. It's been, at times, a chance to not only share a vision of a more just education system but to share a vision on ways to get there. Right now we're in need of human and financial resources to keep the classes going. 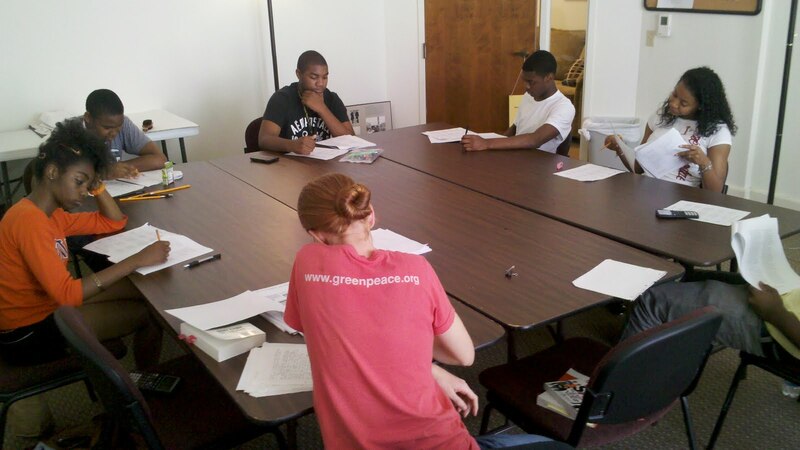 We need folks that are willing and able to provide SAT tutoring once a week. We also could really use some help in purchasing material for the session. Services like these are only possible if folks from the community step up and help us make them happen. Will you help us? 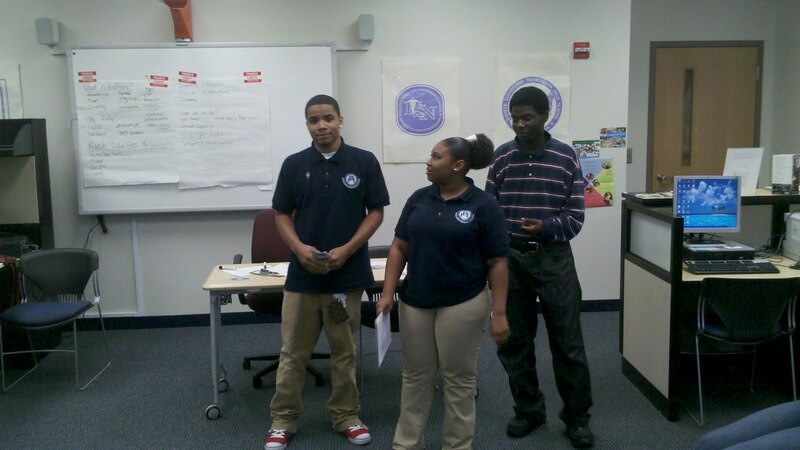 The AFSC got a great opportunity to reach out to high schoolers when we were invited to present to four classrooms full of students from Martin Luther King High S chool Monday. 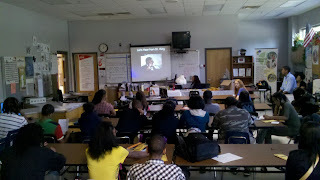 The presentation began with a piece on Dr. King's "Beyond Vietnam" speech. The presenters played snippets of the speech and discussed how it transformed King from the most beloved public figure in the US to a persona non grata who was no longer invited to the White House--and later it got him killed. The presenters went on to discuss the three ills Dr. King identified in the speech--militarism, racism, and poverty--and their relevance today. They brought up issues such as scapegoating of immigrants, the foreclosure crisis, the prison industrial complex, education cuts, and bloated military spending. 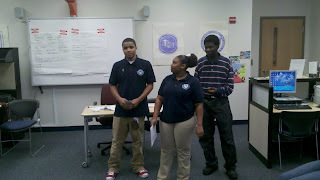 Then the students were asked to talk about problems in their communities that they would like to see changed; they brought up issues like drugs, violence, and apathy on the part of teachers. One young woman said that it seems like teachers "give up before we do". 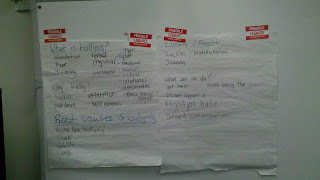 Next we explained that a lot of people see the ills in their communities and want them to change--but stop there. They do not take action to correct the problems in the world, perhaps feeling incapable of changing things. But that is not the path that Dr. King or the so cial justice activists he worked with chose. 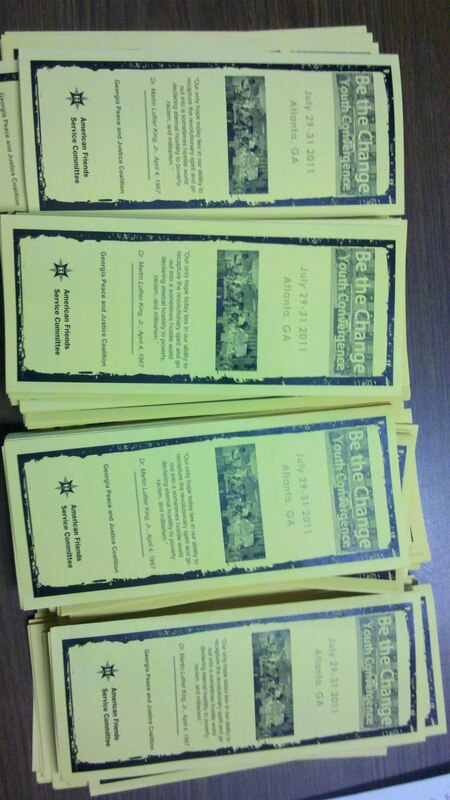 We introduced the Be the Change convergence, to be held at the Horizons School in Decatur the last weekend in July. The conference aims to educate youth about the problems identified by Dr. King and to teach them the skills he and other social justice activists used to fight them. At the end of the convergence the attendees will choose the issue they most want to correct and build an activist campaign around it. 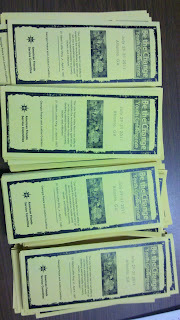 The students were given brochures and invited to the conference. 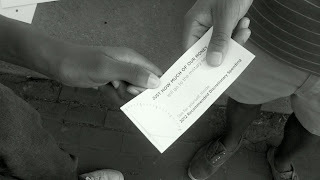 Over a dozen students signed up for the conference on the spot, and others took the pamphlets with them. Each classroom had 20-60 students, so we estimated we spoke to between 100 and 200 students. Recently the King Center started an after school program at Booker T. Washington high school, which is the school Martin Luther King Jr graduated from. Several weeks ago the King Center invited us to be a part of their after school program and we graciously excepted. 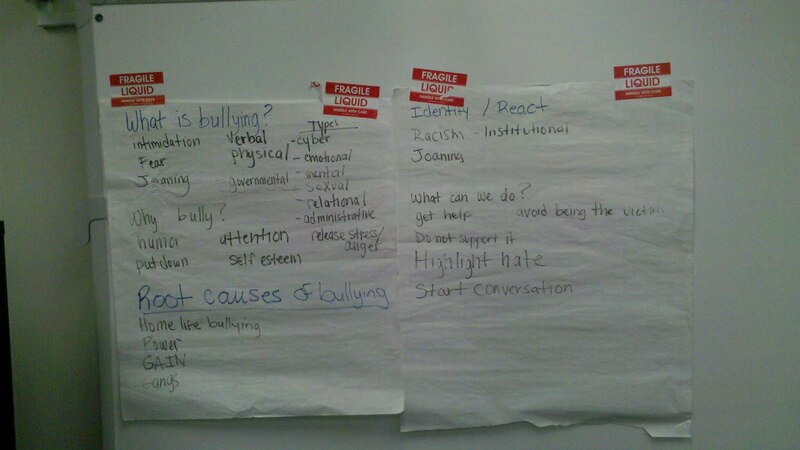 Our assignment was to organize a workshop on Bullying, Peer pressure, and how to respond to both. These issues are of course a part of everyday life for most high schoolers. We knew that we wanted to avoid the standard," Bullies are cowards" type talk that basically can come across as simply criminalizing the student body. Bullying on the school yard can and should be connected to the larger systems of violence and oppression plague of global society. If history and modern foreign policy teaches us that whoever has the most wealth and weapons is right then why is it shocking when this dynamic plays out on the school yard? 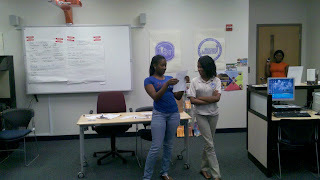 Students at the workshop basically boiled bullying down to this: The humiliation of others to build yourself up. Sadly we've seen this behavior almost everyday at the Georgia capitol during this legislative session. Whether it's low income students seeing their public school defunded so that corporations can keep record tax breaks or undocumented Latino's being forced to watch Georgia transform into an apartheid state so that right wing politicians can appease their base(at the cost of Georgia economy). These are all connections that youth were able to establish. What is it about our culture that seems to foster competition and conquest, over cooperation and community? It's appropriate to point out that Martin Luther King was well known for establishing the links between systems of violence and oppression, so it was exciting to be a part of the discussion at the King Centers after school program at MLK's old school. After much discussion students were asked to split up into three groups and create anti-bullying public service announcements for their peers. Students came up with some pretty good ideas. We're really glad that we got to play a role in starting some of the conversations today, and we can only hope that some of them will continue as weeks pass. 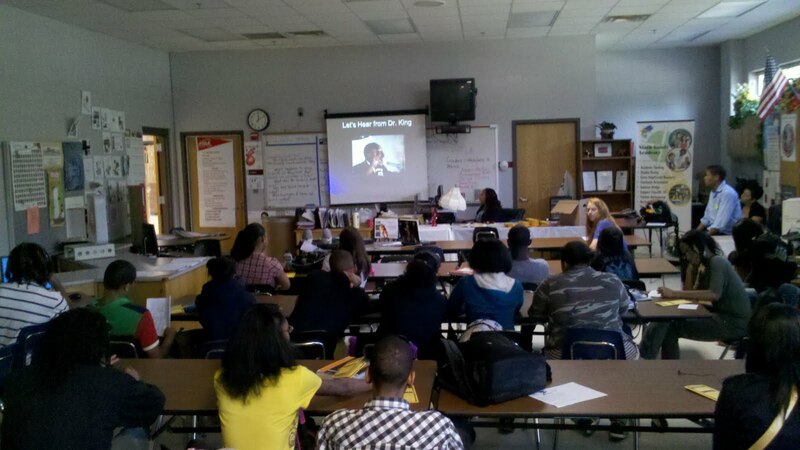 Big thanks to the King Center for allowing us to be a part of their after school program. Today is the last day that HB 87 can pass the house and senate and as I type bill is being debated on the floor of the Georgia house of representatives. Outside the capitol hundreds of human rights activist have been holding a vigil, and holding onto hope that those under the dome will vote to kill HB87. 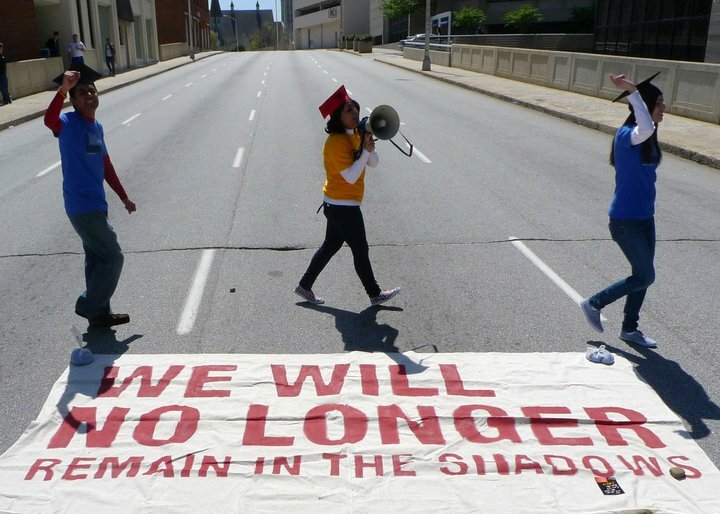 During a time of economic crisis it's not surprising that some in the Georgia house and senate have attempted to scapegoat our state's money problems on anyone but themselves, and undocumented workers seem to be a pretty easy target being that they have been politically voiceless for decades. 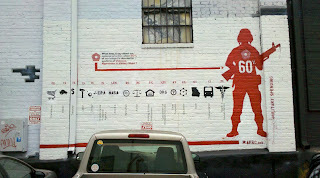 The reality, however, is much different then what HB 87 Architects painted. 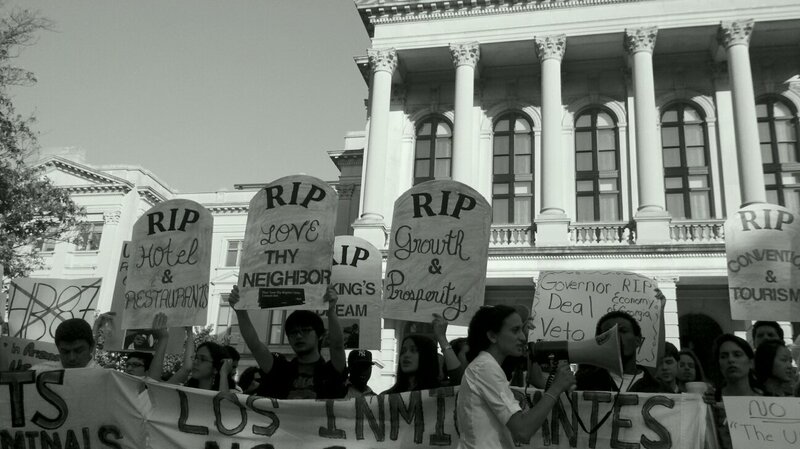 Georgia's top two industries are agriculture and tourism, both industries are fueled by undocumented workers, both industries have lobbied against HB 87. The similar Arizona bill that passed last year sparked international boycotts of the state which cost the state millions in revenue. Georgia's economy simply can't afford this type of legislation. But this is about much more than economics. This is a human rights issue.Immigrant's rights are human rights. What people who vigiled today at the capitol are fighting for is simply the right to exist in a space they have called home for years, a space they have contributed to greatly. Borders, boundaries, corporations, and nations are simply ideas. We should care less about these ideas than we do actual human beings with beating hearts and dreams of their future. A future where we're all free to travel where we please, attend school where we please, seek employment where we please. A future where we all have the dignity and freedom to exist is a space we call home. A future that never again rolls out the red carpet for Jim Crow laws, a future that refuses to legislate hate. 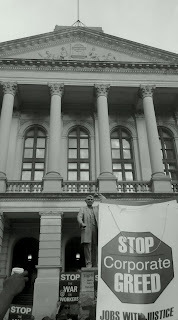 Sadly HB 87 passed tonight, effectively rolling out the red carpet for Jim Crow. The fight isn't over, we then turn our eyes, our energy, our voice, and our prayers to Governor Deals office with one singular message: Veto This Bill! Funding education through a state-run lottery system seems like it would be a great way to reduce the cost of college for students. It would also increase enrollment by in-state students at the various colleges and universities. Also, requiring that students maintain a B average seems like it would be a useful tool in increasing grade scores throughout the state. By making in-state colleges more affordable such a policy would increase the productivity and human capital of its citizens along with the other positive externalities that come with increased education. This policy also seeks to alleviate the educational credit market failure since it is difficult for people to go to banks to get funds to finance education. Ultimately, it would increase a family’s utility since they do not have to sacrifice consumption of another good now that they have the extra money from the scholarship to pay for education. In theory, this policy would be a good redistributive tool. Because it is based on grades, a person from a lower income that has adequate grades will now have the money to pay for college and more people from lower incomes can now finance college. However, we will see that such redistribution may not be the final result and that implementing such a policy could have some undesired effects and causes for concern in terms of equity and grade inflation among other areas. A great example of the implications of such is policy can be seen from the HOPE scholarship in Georgia which was introduced in 1993. From the onset, we must look at how this policy is funded and who benefits most from it. Most people who participate in the lottery are in low-income households and are typically minorities. Most of the recipients of the HOPE scholarship are white and upper-middle class. “The 20 zip codes with the most lottery winners had incomes below the median for the state of Georgia while the 20 counties with the most HOPE recipients had incomes 72% higher than the other counties” Also, households with a high socioeconomic status have a 46% probability of receiving the full HOPE scholarship while low socioeconomic households have only a 10% chance of receiving the scholarship in full Those receiving the scholarship are people who would have gone to college regardless if there was such a scholarship. This policy can be looked at as a regressive tax since, essentially, the poor are contributing disproportionately more to the program and benefiting the least. In essence, the poor are funding schooling for the wealthy. This regressive tax could lead to further disparities in equity. Before the introduction of the HOPE scholarship in Georgia, whites were 11% more likely to attend college than African-Americans. 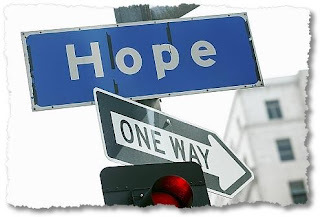 Since HOPE, that gap has increased to 26% For the most part, the HOPE scholarship has not changed who goes to college, but by funding college in the state it has changed where students go to college. If we would like to increase equity with this program, it may be wise to implement a price cap or other stipulations on who can be eligible for the scholarship. This would take away from the merit-based nature of the scholarship and move it closer to a needs-based scholarship. Doing this would target the scholarship more towards those who need it, those who typically would not have attended college without the scholarship’s funding. It would also help in terms of continued funding for the program. When the HOPE scholarship was introduced in 1993, it was only for students who came from a household with an income of less than $66,000. This price cap was then elevated to $100,000 in 1994 and subsequently erased in 1995 (Rubenstein, 2003). 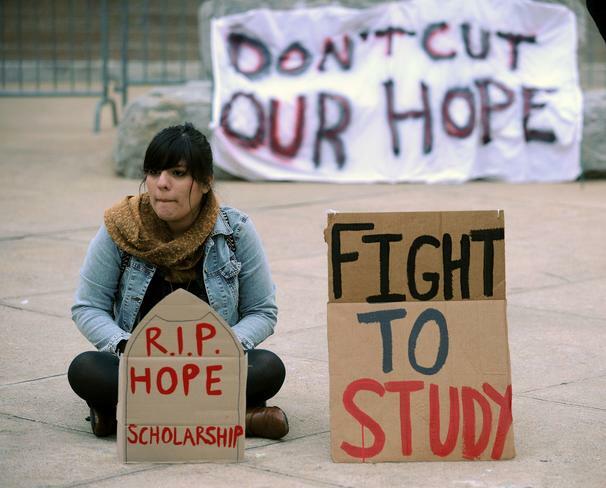 Since the elimination of the price cap, more Georgia students have become eligible for the scholarship. In 1995 when the price cap was erased, “54.7% of high school graduates qualified for the scholarship. By 1999 the total number of high school graduates had increase by around 10% but those qualified for the scholarship increased by 23% to 61.4% of all high school graduates” While it is good that more students qualify for the scholarship, the percentage of people participating in the lottery has not increased significantly. More students who would have already gone to college without the scholarship are draining money from the program and raising cause for concern as to how the program will be able to provide money for all of these scholarships in light of increasing tuition costs for college. Since the HOPE scholarship makes going to school in-state more affordable, it has helped keep the smartest of Georgia’s students in the state. Research by economists at the University of Georgia’s Terry College of Business have found that the scholarship has reduced the number of students going out of state to college by about 560 students per year Since the introduction of the HOPE scholarship in Georgia, in-state college enrollment by 18-19 year-olds has increased by 7% Due to the increase in SAT scores and the retention of more of Georgia’s brightest students, in-state colleges are becoming more competitive and attracting better quality out-of-state students as well. According to David Mustard, “The qualifications of both in-state and out-of-state students are going up at about the same rate” Since HOPE began, college freshmen SAT scores in Georgia have increased 40 points. Funding education through a state-run lottery system would have many positive outcomes: test scores would increase, college becomes less expensive for students, colleges and universities in the state become more competitive, and there is more schooling for preschoolers. However, if provisions are not adjusted correctly, this policy could also reduce equity in who benefits the most from this program resulting in other less desirable externalities. Rubenstein, Ross, "Helping Outstanding Pupils Educationally: Public Policy Issues of the Georgia HOPE Scholarship Program and the Lottery for Education" (2003). Center for Policy Research. Paper 18. We've been working with Camron Wiltshire, of We Are Change Atlanta, for several months to develop a mural for the 5-Spot wall in little 5-Points. 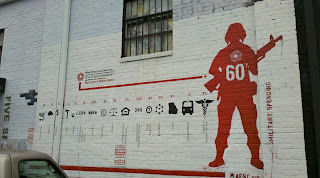 The 5-Spot gave us permission to put the mural up last October after our Love Bombs Over Euclid Event. 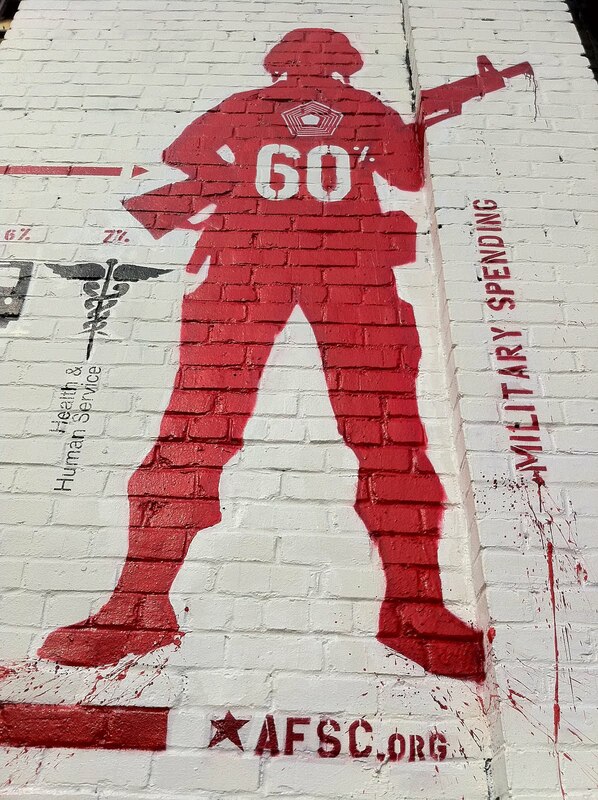 Camron purposed a mural inspired by AFSC's "One Minute For Peace" campaign, which basically draws attention to the gross crisis in spending priorities our federal government continues to perpetuate. Everyone was knocked out by Camron's design. Volunteers came out of the woodwork to help put the mural up, it really looks great. We're really excited to have the mural up in such a prominent spot. Thousands of folks walk by the wall off Euclid over each weekend. Big thanks to the 5-Spot for the space, Camron Wiltshire for the amazing design and heading up the mural painting, Angie Brooks for scaffolding, SCAP for providing resources, and all the volunteers who helped paint, took pictures and video!!! There will be a few minor touch ups to the mural this week, including the addition of the One Minute For Peace website and the articulation that the numbers presented are the 2012 recommended discretionary budget. Eight years ago, on March 19, the United States led the attack on Iraq. This year, on that same date, US forces, in conjunction with those of other countries, embarked on an aerial assault of another Arab country, Libya. 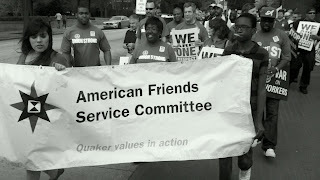 The American Friends Service Committee is appalled by the countless deaths, the untold suffering, the displacements of people, and the physical destruction in Libya. We pray for those who have already lost their loved ones through violence, whatever may be the source. Our long experience in the Middle East and Africa, along with our Quaker witness for peace, compels us to speak out about the crisis in Libya. 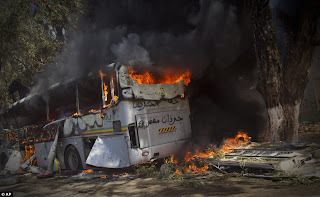 We deplore the violence and killings inflicted by Qaddafi’s government on its citizens, as we abhor the actions of any government that places their own self-preservation above the well being of their people. 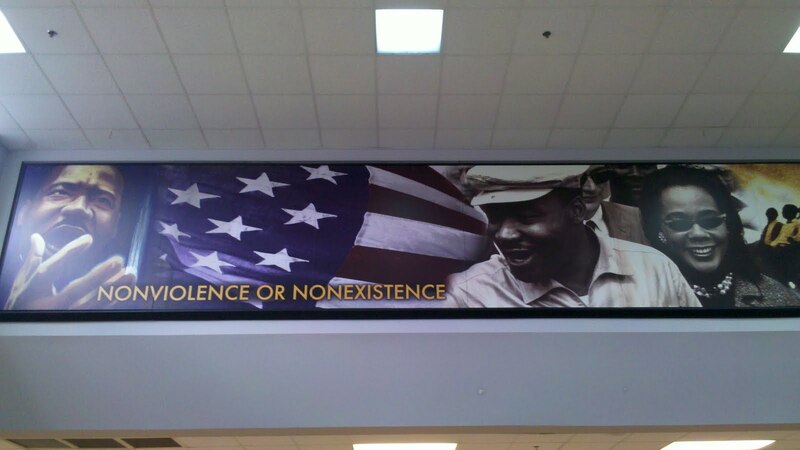 However, our revulsion does not justify violence, or war. Our experience has shown the futility of challenging violence with violence. We have seen that history has proven time and again that war and violence do not bring about justice or a lasting peace. Instead, they always take a terrible toll on civilians. 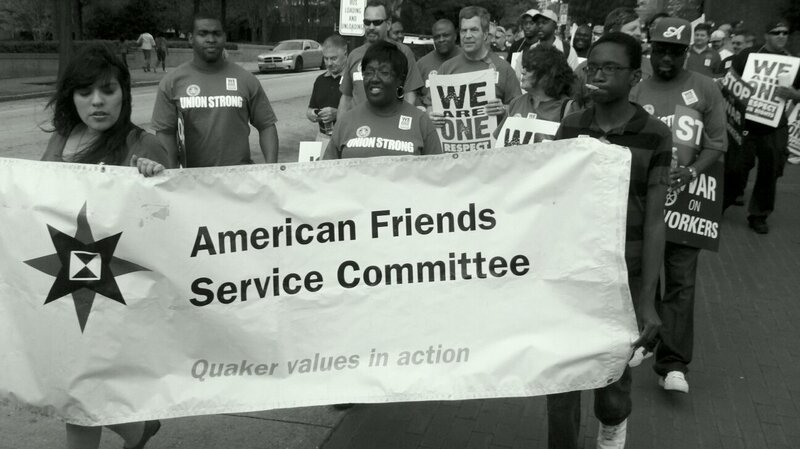 This is why, as a Quaker organization, we advocate for nonviolent social change. We support the people of Libya as they struggle to protect their human rights and to transform unjust social and political systems in their country. We note that in Egypt and Tunisia, remarkable change has been achieved in a short time with minimal violence or outside intervention. Recent history shows how nonviolent approaches can prevail to overcome extraordinary oppression. Unlike military action from another country, these approaches serve the people over the long term. In addressing the serious issues of international peace and security, we urge the use of non-military methods by all involved. In this case, the international community has not exhausted the available nonviolent alternatives to protect the people of Libya. The significant resources required by the chosen course of military intervention could be better used for intense diplomatic and political efforts to alleviate the crisis. 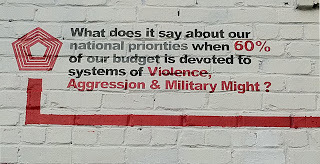 We believe that it is morally unacceptable to allow military tactics to lead our response to human crises. 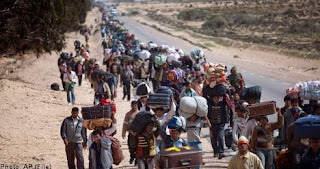 The current foreign military assault on Libya is a step in the wrong direction, one that may lead the country to further instability, human suffering, and protracted violent conflict. 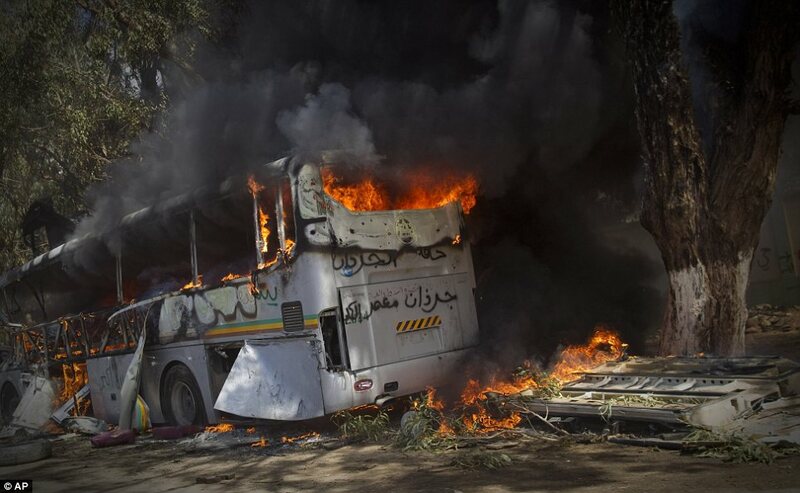 The Libyan government to end all violence against its own citizens and to fulfill its obligation to protect its citizens. The coalition forces, including the United States, to cease the air bombardment and military involvement in Libya, and renounce any intention to impose regime change by force. The United Nations, the African Union, and the Arab League to increase diplomatic efforts to engage all parties to the conflict in dialogue, to support an immediate ceasefire, and to find political solutions that serve the needs of the Libyan people. All parties to allow full access for humanitarian agencies to provide urgently needed assistance to internally displaced people, refugees who fled to neighboring countries, and the tens of thousands of migrants stranded in Libya. We urge that emergency assistance and protection be extended to all in need on the basis of humanitarian principles and not on the basis of political criteria or military objectives. As part of our Be The Change Curriculum, Several Horizons School students decided to write this little jingle in response to not only the multiple wars/occupations our country is currently waging, but the trickle down effect these systems of violence and oppression have on our communities. 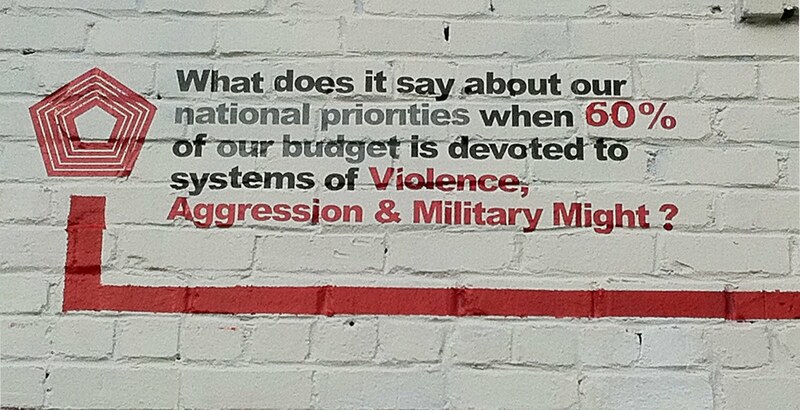 When governments model violence as a means to solve conflict, extract natural resources, and force their will upon others, what's the cost to our communities? Zack: Violence seems to be on important issue not only in our country,but all around the world. This cheery little tune sends a message of non-violence to all who hear it. Sami: از جنگ چیزی حاصل نمی شود. جنگ را رها کن و بسوی صلح قدمبزن. War is not the thing. Let go of the war and forward for peace. Ahmed: हम दोस्त हो सकता है क्योंकि दोस्ती है दुनिया बनाता चाहिए. We should be friends because friendship is what makes the world. This afternoon over a hundred people gathered at Hurt Park for a demonstration of undocumented students demanding their rights to higher education. Undocumented students shared their stories of coming to this country and exactly what they were fighting for. 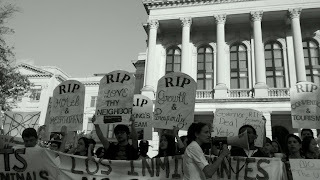 Supporters gathered and chanted against the ban of undocumented students in 5 major State universities. 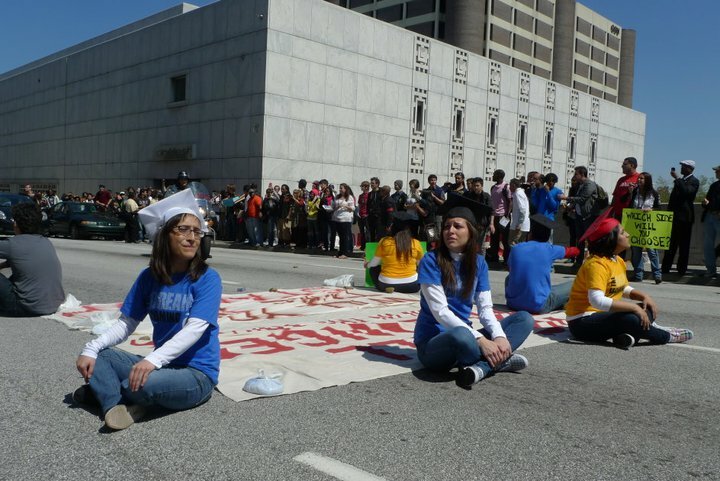 This protest, organized by students across the country- with the help of GLAHR, marched into Georgia State and delivered a letter demanding the university to refuse the ban. The people united then marched their way to Courtland street where they occupied the road in an act of civil disobedience. Several motorists were blocked for over an hour before law enforcement were able to direct traffic the opposite direction of the protest. Students from the university were excited to see such an action occuring and many of them who had seen this happening from windows of the school came down to support. As more and more people came to support and block the streets there became awareness to the public on the Board of Regents ban of undocumented students. 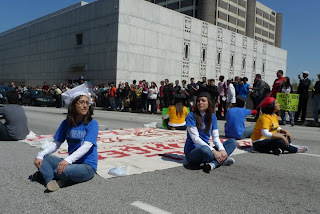 The 7 young brave and inspiring men and women sat across courtland street not to block traffic, but to make a statement. This statement is that they will no longer remain in the shadows and wait for legislators and government officials to make a change. They can no longer wait, and will no longer wait. 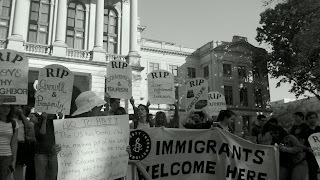 They really are undocumented and unafraid. After nearly two hours the undocumented students were arrested by zip ties and taken to Atlanta City Jail where many people will continue to support them by having a vigil at 7:30pm. La lucha sigue. The fight continues to make education a basic human right. We are in awe of the bravery of these students who may now be risking deportation. We have chosen a side and that side will no longer be apologetic for being undocumented, will no longer be afraid, and will no longer wait for change. This is the side that wont stop fighting. http://www.thedreamiscoming.com/ For more information or to donate. 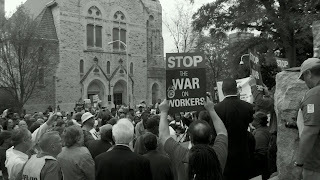 Today around six hundred people gathered at the King Center to march to the Georgia State Capitol to demand that governments across the country and corporate interests respect workers' rights. The action was part of the international campaign, We Are One. It was no accident that the rally was scheduled for April 4th, the day Martin Luther King was assassinated. Today marked 43 years since Dr. King was murdered outside his hotel in Memphis. He was in Memphis to support sanitation workers right to collectively bargain for a better life. 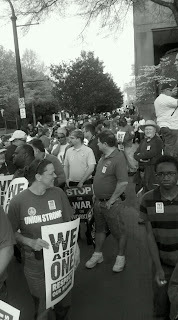 Today's rally brought out workers, students, community members, young, old, black, white, brown, and everything between. Everyone that graced the mic at the rally made case for connecting all struggles. Workers rights, students rights, immigrant rights, gay rights, need to be in the sentence. An attack on one, is an attack on all. 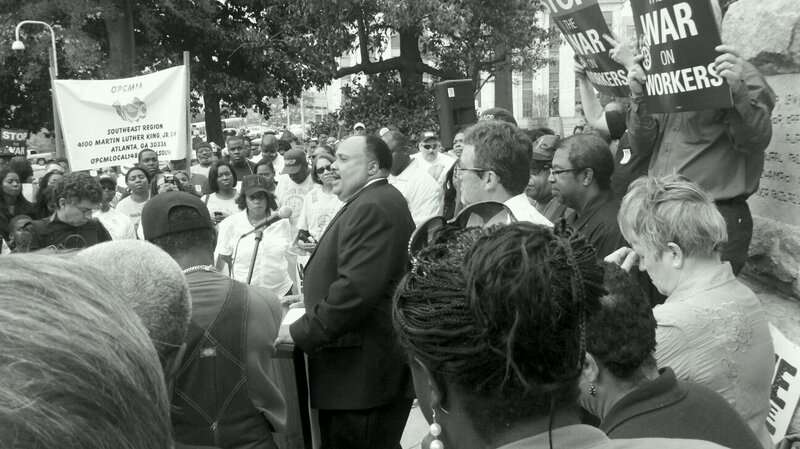 Martin Luther King III spoke at the capitol, reiterating his fathers most relevant messages on labor issues. His speech drew much applause but was also a painful reminder that all the issues Dr. King died for are just a pressing as they ever were. Workers rights are under attack, our state and federal budgets are being robbed by military and prison industrial complexes, programs of social uplift continue to disappear while wallstreet gets billion dollar bailouts, and Jim Crow has moved from the law books into economic policies. 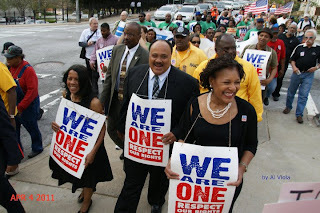 Martin King III said that if his father was alive today, he would be fighting for workers rights. 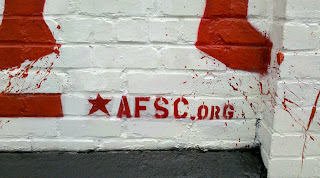 AFSC was also there to show our solidarity. 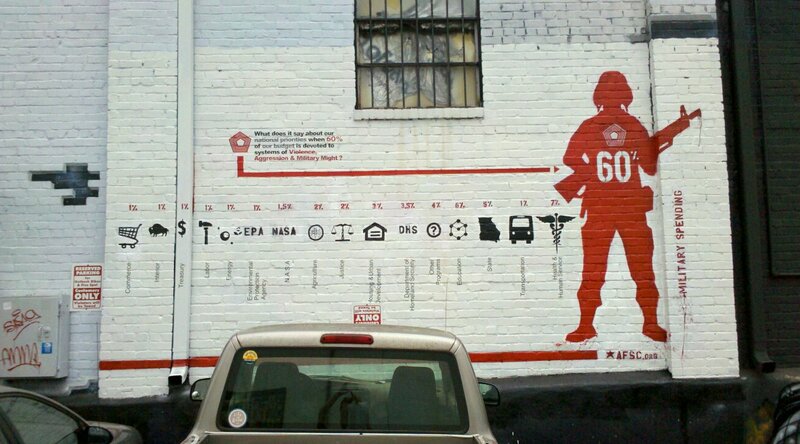 We passed out countless, "One Minute For Peace" fold outs that make our federal budget easy to read. The fold outs highlight the economic crisis of priority. The resources our communities need are there, they're just being spend on the wrong things that benefit the wrong people. 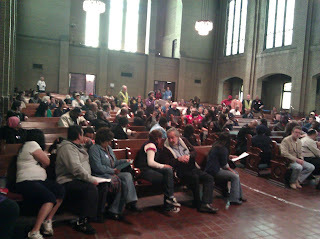 Jobs with Justice hosts "Speak Out for Jobs Now!" 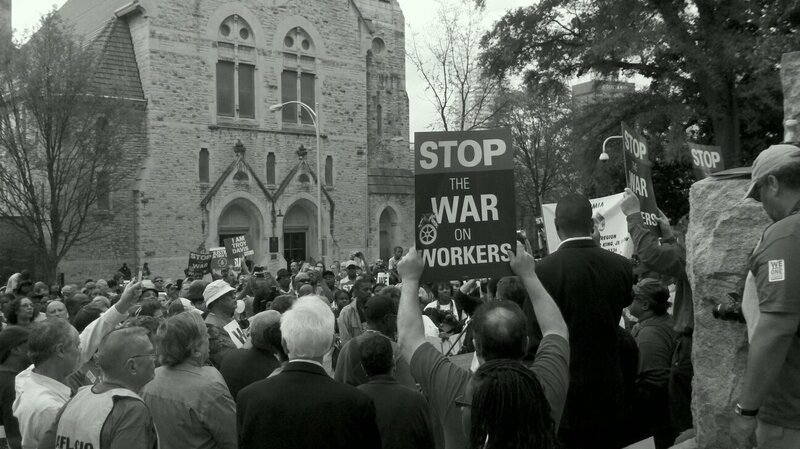 Hundreds of Atlantans gathered for the April 2 Jobs With Justice event that was partially sponsored by the AFSC. Jobs With Justice, a national campaign for workers' rights, held the event at Trinity Church near the capitol. Service organizations and advocacy groups were present to help people with their needs including expungement support, signing up for food stamps, TANF, and medicare. Volunteers from the Atlanta Volunteer Lawyers Foundation were there to make people aware of free legal services for help with legal issues like eviction defense, landlord-tenant disputes, protection from unlawful debt collection, and making employers pay unpaid wages. Attendees could also receive free massages and haircuts. BLOCS, a group that works to eliminate brutality from the Atlanta Police Department was there, as well as Kelli's Childcare Collective, a group that offers free childcare at activist events. 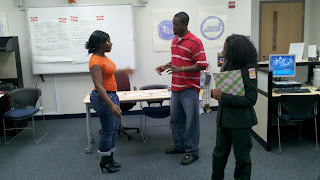 There was also an opportunity for individuals to speak out about their situations. A large number of people testified, many of whom said they felt desperate and at their wits' end. One young woman explained that she has been looking for a job since she was 12 but cannot get one because she is only 17 and has no work experience. One man testified about how hard it is to find a job with a criminal record. Another man said he has skills and work experience, but spoke about the difficulty of finding a job with a homeless shelter as the only address he can put as his on job applications. Another said "I spent time in jail, got out to a halfway house, but I had no work history so I couldn't find a job." Since he was not able to meet the employment requirements for the halfway house, he was sent back to prison. One woman has worked as a home health aide and has her certified nursing assistant certificate, but reports that she still can't find a job despite good work experience, good resume, good references, and the certification. Another woman explained that she had worked in several different fields, including security and law enforcement and does not have trouble getting jobs--but she cannot keep them because of anti labor laws like Right to Work and laws that allow employers to fire employees at will for arbitrary reasons. Still another woman explained that she had had a job but that someone else had been imprisoned with her name, saddling her with a felony record and causing her to lose her job. Now she is entangled in a bureaucratic snare of trying to get her name cleared and her record straight. Among the speakers was State Senator Nan Orrock. Orrock said "we must...rebuild a movement" of working people to demand fair treatment. She denounced the anti-labor laws of the recent legislative sessions and said public employees "are not harming the economy, they're part of the backbone of the economy." She spoke of the foreclosure crisis and the fraudulent mortgages millions of people were tricked into, and decried the fact that "the person who's losing the home gets the blame, not the people who caused the crisis." 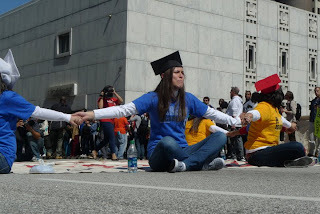 She also enjoined the crowd to stand up against the wave of anti-immigrant legislation that has been introduced this session, saying the bills "fuel hatred". She urged the crowd to call their voters' office and the Lieutenant Governor's office and demand that they "kill those anti-immigrant bills". State Senator Vincent Fort also spoke, saying the anti-immigrant legislation is an attempt "to pit black people against brown people ... trying to turn us against each other because they know if we came together there'd be hell to pay." He also spoke against the recent cuts to education passed by the state legislature, saying that they hurt workers because the HOPE scholarship will no longer pay for technical schools. He also decried the changes to the HOPE scholarship that disproportionately target poor and minority students, who will lose their scholarship money more than wealthy white ones. He called on listeners to boycott the lottery, which has been used to fund the HOPE scholarships: "why should you pay to finance your oppression? ... Why should you pay to send a corporate executive's child to school?" He pointed out that "the lottery money comes from working neighborhoods" and goes "from Bankhead to Buckhead". 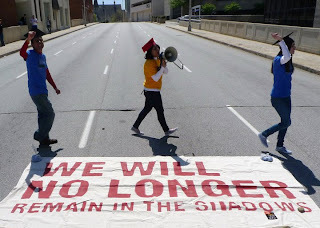 Importantly, speakers also lay down concrete next steps for attendees to follow to demand jobs with justice--"not slave jobs, but jobs with a living wage, with benefits, and enough leisure time to spend with our families," said JWJ organizer Tony Romano. 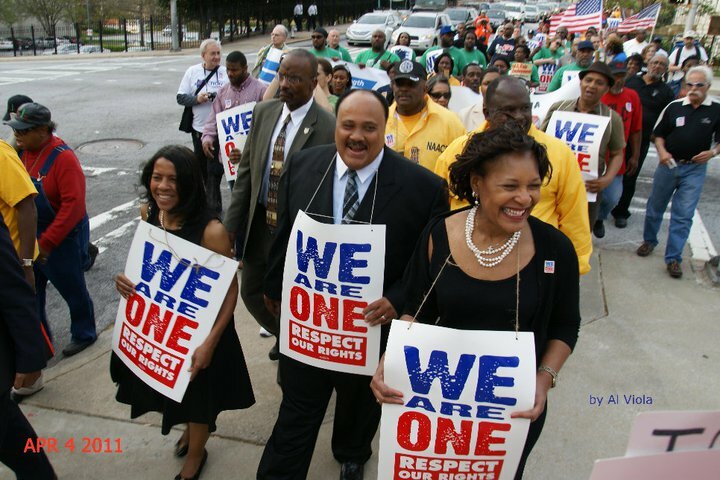 Organizers called for a march on April 4, the anniversary of Martin Luther King Jr.'s assassination, to demand respect for workers' rights. King was killed when he was in Memphis supporting striking sanitation workers who were demanding fair treatment. The march is set to start at the King Center on Monday April 4 at 5:30 pm.